Yesterday, the media buzzed with the revelation that Stephen Hawking had completed a paper two weeks before his death. This paper supposedly contains some breathtaking insight. The headlines refer to a paper titled “A Smooth Exit from Eternal Inflation” in collaboration with Thomas Hertog. The paper was originally uploaded to the arXiv in July last year, but it was updated two weeks ago. It is under review with “a leading journal” which I suspect but do not know is Physical Review D. Thomas Hertog gave a talk about this at the conference which I attended last summer. You can watch the video of Hertog’s talk here. Since the paper doesn’t say anything about detecting parallel universes, I was originally confused whether the headlines were referring to another paper. But no, Thomas Hertog confirmed to me that the paper in question is indeed the paper that is on the arXiv. There is no other paper. The paper is based on an old idea by Stephen Hawking and Jim Hartle called the “no-boundary” proposal. In the paper, the authors employ a new method to do calculations that were not previously possible. Specifically, they calculate which type of universes a multiverse would contain if this theory was correct. The main conclusion seems to be that our universe is compatible with the idea, and also that this particular multiverse which they deal with is not as large as the usual multiverse one gets from eternal inflation. The only thing that the paper does say is that inflation took place. And inflation predicts that gravitational waves produced in the early universe should leave an imprint in the cosmic microwave background (CMB). This is the CMB polarization signal that BICEP was looking for but didn’t find. There are, however, some satellite missions in the planning that will look for it with better precision. So how do we detect parallel universes? By detecting the CMB polarization. I do not kid you. “This model predicts that our universe came into existence with a burst of rapid expansion called cosmic inflation. A big bang of this kind amplifies gravitational waves which in turn show up in satellite images of [the pattern of temperature fluctuations in] the cosmic microwave background. Future satellite missions should see this, if the theory is correct. Observational evidence for the no-boundary model [in the form of gravitational waves from the big bang] would yield strong evidence for a multiverse. This paper provides a step towards a mathematically sound and testable model of the multiverse. That constitutes a significant extension of our notion of physical reality. Allow me put this into perspective. Theoretical physicist have proposed some thousand ideas for what might have happened in the early universe. There are big bangs and big bounces and brane collisions and string cosmologies and loop cosmologies and all kinds of weird fields that might or might not have done this or that. All of this is pure speculation, none of it is supported by evidence. The Hartle-Hawking proposal is one of these speculations. In case that was too metaphorical, let me say it once again but plainly. 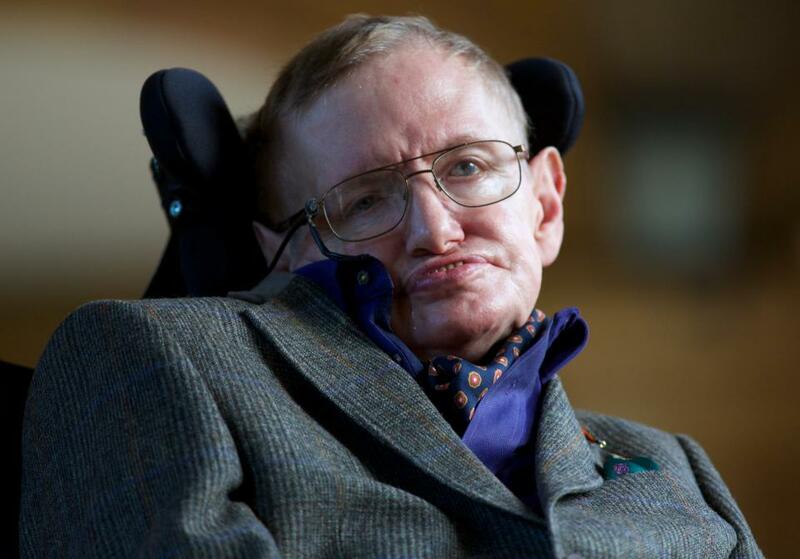 Hawking has not found a new way to measure the existence of other universes. Stephen Hawking was beloved by everyone I know, both inside and outside the scientific community. He was a great man without doubt, but this paper is utterly unremarkable. Note added May 2nd 2018: The paper was now published in JHEP. It is always refreshing to get a non-exaggerated, but precise description of what has actually happened, thank you. Also, if the paper is based on the no-boundary proposal, has it not been ruled out by now? What is your opinion on that paper? Obviously Stephen Hawking is an amazing scientists. Scientists because of who he was and who people thought he was. I don't think it would be a bad thing if his final work didn't at least get people thinking that there might be ways to prove a multiverse, even if his last idea is unremarkable. If there was a multiverse, wouldn't the pull of gravity from these other universes affect the red shifting of light according to the inverse square law. Therefore, whatever the main driver for red-shifting of light is, there should be some diminishing affect the farther away someone is from that other universe? Your comments are, as always, the most pertinent end rigorous we can find in the net. Thanks to let us understand, in the right way, what mainstream information give us to eat every day! Thanks Sabine...I just spent an hour or so looking at the preprint and then looking at the newspaper articles and then getting very confused! Seems the media were breathlessly reporting similar nonsense 90 years ago ("Einstein on verge of major discovery," New York Times). But as an American already living in the parallel Trump universe, I'll make the jump to another one any day.
" And inflation predicts that gravitational waves produced in the early universe should leave an imprint in the cosmic microwave background (CMB). This is the CMB polarization signal that BICEP was looking for but didn’t find. There are, however, some satellite missions in the planning that will look for it with better precision." would NOT finding gravitational waves produced in the early universe should leave an imprint in the cosmic microwave background falsify all models of inflation? Sabine said, All of this is pure speculation, none of it is supported by evidence. Where I think theoretical physics errs grossly is the belief among many if they can model their pure speculation mathematically and have it be consistent with some current observations than they must be right. What disappoints me is the number of extraordinarily intelligent people working in this manner slows real scientific progress unnecessarily. I believe there are some empirically strong foundations that can possibly rebuild the dynamics gravity that require minds who value evidence and strong fundamental foundations over speculation. It seems as time passes there are fewer and fewer of such minds in the field. "none of it is supported by evidence" Chemistry says enantiomers are utterly indistinguishable absent a chiral background (opposite shoes embedded within a preponderant left foot). if QM is considered, 50 years of physical theory do not predict the observed universe outside curve-fitted intervals. One hour in commercial equipment (brightspec.com) using a literature-synthesized non-racemic molecule sample fundamentally falsifies curve fits by observing their defective postulate. Reality misses beauty by an emergent part-per-billion, allowing the universe. Look. Partially resolved C_3-prolate or -oblate chiral tops are literature syntheses. A muck chiral rotor is two undergrad lab steps. Physics is arrogant. Physical theory can be screwed (a joke amidst lab coats, a terror for crossed nablas). So actually, if you find a coin on the street, you know that Bill Gates did not recently walk by. Thanks for this summary Bee. But if it was that cut and dried in terms of the paper being not only "unremarkable" but apparently pretty idiotic, surely the authors would have recognized this and reviewers will also? This is a good article. One that all aspiring science media sudents should read. Back to Hawking's career...'A Tale of Two Scientists'. One of the top half dozen minds of the 20th century. However, not of the 21st century. Sabine is not a multiverse fan. She is also not a fan of science fiction posing as theoretical physics. The paper is not "pretty idiotic," it's just not what it's been sold for. It's a study about the shape of universes in a multiverse of a particular kind. It doesn't make any prediction from which you could infer the presence of other universes. The not very logical cosmological term multiverse (no unquestionable definition and no unquestionable existence) should be replaced by another word in order to avoid misunderstanding: examples of real multiverses are my favourite Iliad and Odyssey. Is the CMB polarisation of Electormagnetic moments rather than gravitational wave ones or both? Would there be anything predictions to be seen in the neutrino background equivalent of the CnB? Hawking has such a media-magnified reputation with the general public that it short-circuits any critical discussion of his life and work. Physics needs a Hall-of-Fame (more than a list of Nobel laureates) which might help put Hawking's career in perspective with the many other great physicists whom the public don't know and maybe never will: Thompson, Dirac, Born, Witten, Hess, Ray Davis, even Maxwell, etc. etc. etc. This is a public outreach concern. BTW, I think the song choice for Bill Gates' angels is "Smells Like Teen Spirit" (Nirvana 1991) or Weird Al's variant if the Windows operating system is considered. Clark Kerr would be proud--he championed the move from "the university" to "the mulitversity." Only recently coming into this space, relieved to find the odd oasis of sane conversation in what otherwise looks to me like flannel and drivel. Construed, as far as an outsider can tell, to complexify and obfuscate to the point where it either preserves the field for complex mathematics, or impresses science funding agencies. Thank you for not afraid to slay some sacred cows. No matter how brilliant of a scientist Hawking might have been or what hardships he had to endure, it should have no bearing on our pursuit of truth and on our evaluation of his ideas on their own merits. Good stuff Sabine. I rather think there are more issues with Hawking's physics than many people appreciate. It's really great to see you present such an unbiased opinion on someone who is a brilliant scientist in his own right but also deserves to be looked at and evaluated in the same way every other scientist is. Your sometimes whimsical writing style is greater proof of a multiverse then any scientific evidence. Thanks for your perspective. Or this might be more accurate..
"There is even less evidence of a multiverse from scientific evidence than seen in your sometimes whimsical writing style"